’S e corpas de theacsaichean sgrìobhte a th’ ann an litreachas, aig bun-ìre. Mar as trice, gus a bhith ga chunntadh mar theacsa litreachasail, feumaidh teacsa a bhith a’ cleachdadh a’ chànain sa bheil e sgrìobhte ann an dòigh neo-àbhaisteach no ealanta, no a bhith a’ buntainn ri cuspairean inntleachdail no feallsanachail. Faodar “litreachas” a roinn a rèir a nàdair fhìrinnich (no neo-fhicseanail) no neo-fhìrinnich (no fhicseanail), no a rèir a dhòigh-sgrìobhaidh — an e rosg no bàrdachd a th’ ann — no a rèir a ghnè — m.e., nobhail, sgeulachd, dràma. 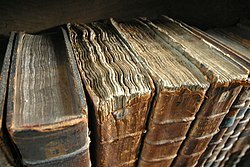 ’S ann às an fhacal litir a tha am facal litreachas dèante, agus ’s ann às an fhacal Laidinn littera (facal a’ ciallachadh litir den aibidil, no, anns an iolra, litreachas, i.e. rudan a tha air an sgrìobhadh ann an litrichean — cf. letters sa Bheurla) a tha am facal litir. Anns na làithean seo, ge-tà, ’s tric a bhios am facal litreachas a’ comharrachadh cuideachd chleachdaidhean labhairteach agus beul-aithriseach, a bharrachd air teacsaichean sgrìobhte annta fhèin. Am measg nan teacsaichean litreachais a bu shine tha Eipic de Ghilgamesh à Sumer agus Leabhar nam Marbh às an Èipheit ('s mathaid roimhe 2000 RC) no na Vedathan às na h-Innseachan ('s mathaid roimhe 1000 RC). Chan eilear cinnteach dè cho seann a tha iad, oir dh'fhàs iad bho beul-aithris mus robh iad air an cur air a' phàipear. Thathar a' smaoineachadh gur ann bhon 8mh linn RC a tha Ilias agus Odysseia le Homer a thòisich litreachas Greugach is Ròmanach Clasaigeach. Airson na linntean, cha robh fàrmhorachd litreachais ann an diofar cheàrnan den t-saoghail cothromach, leis nach robh gu leòr eadar-obrachaidh ann eadar culturan sònraichte mar cultar na Roinn-Eòrpa, cultar Arabach, Innseanach, Sìneach no Seapanach. Mar sin, 's ann doirbh tuairisgeul a thoirt air litreachas an t-saoghail san fharsaingeachd. Anns na linntean mu dheireadh thòisich na diofaran seo ri dhol à sealladh; aig an aon àm, ge-tà, bha buaidh dona ann air na cultaran agus litreachasan mion-chuid. Aig deireadh na 20mh agus toiseach na 21mh linn thàinig atharrachaidhean eile le nochdadh mheadhanan ùra mar rèidio, telebhisean, an t-Eadar-lìon no leabhraichean eileagtronaigeach. ↑ MacBain, Alexander, Caoimhín Ó Donnaíle ⁊ John T. McCranie (1982): “An Etymological Dictionary of the Gaelic Language” (Gàidhlig), td. roinn 24. Gairm (air an làrach-lìn An Ceantar). Air a thogail 15mh dhen Lùnasdal 2017. Air a tharraing à "https://gd.wikipedia.org/w/index.php?title=Litreachas&oldid=537228"
Chaidh an duilleag seo a dheasachadh 15 dhen Lùnastal 2017 aig 18:40 turas mu dheireadh.